Nice Yoga Magazine, … but what’s that article got to do with yoga? In fact, since the launch of The Yoga News, that’s been a question from readers that has frequently landed in my inbox. When I started publishing this yoga magazine, eight months ago, I wasn’t entirely certain what it was going to be. Those of you who have been receiving it from the beginning have surely noticed it evolving from issue to issue. All that I knew at the start was that I didn’t want to create just another yoga newsletter. I didn’t want The Yoga News to be your typical yoga magazine either, with glossy pictures of perfect people in perfect yoga poses, and pages of articles about “this” yoga practice or “that” yogic concept. But different how? That was the question. For me, yoga has always been more than just performing a regular routine of yoga exercises. I know that many of you also agree. But, at the same time, I really don’t here many folks saying much more about it – and there is so much more that can be said about yoga. SO MUCH MORE! To live a yogic life means more than simply eating a healthy yoga diet, or doing neti kriya in the morning, or even observing the yamas and niyamas in our daily activities. It means to view the world around us, everything, from a “yogic perspective.” It means to strive forth into our day with an outlook that demonstrates a deeper understanding of the interconnectedness of everyone and everything, and most importantly, the impermanence of all that we have, see and do. So it makes no difference whether we are talking about personal health, relationships, pop culture or politics, a broader general yoga discussion can demonstrate how the teachings of yoga are relevant to all of these things. 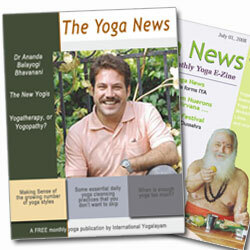 Some of the editorial in The Yoga News endeavours to look at current issues, things that are very real parts of our everyday lives, through the eyes of a yogi – to peer underneath their surface, to cut through the rhetoric and conditioned ways of viewing life, and to put a greater, spiritual perspective upon all these things. I think this is important, and from all the wonderful feedback I get each month, I think that many of you do too. Of course, I’ll continue to publish unique yoga articles in our yoga magazine as well, such as our breaking news on the historic formation of the Indian Yoga Association; or commentaries on hot topics of debate such as the yoga sports competitions (Olympic Yoga: is it too big a stretch? ), or the use of yoga props in yoga practice (Yoga Props: a help, or hindrance?). I’ll keep profiling some of the brightest lights in the yoga world today, like Meenakshi Devi Bhavanani; carry on discussing important yoga issues like The Loss of Sanskrit in Yoga; and sharing more significant research on yoga with you (such as The Effects of Yoga on Back Pain). Along with that, though, I’ll continue to strive to make this yoga magazine a unique platform for taking a look at the world around us, as it is in all its splendour and its unpleasantries, from a yogic perspective. Because, after all, it’s the way that we look at everything we do, and the attitude that we take towards all of the aspects of modern, day to day life, that displays whether or not we are living a yogic life. That, my dear friends, is what this article has to do with yoga.